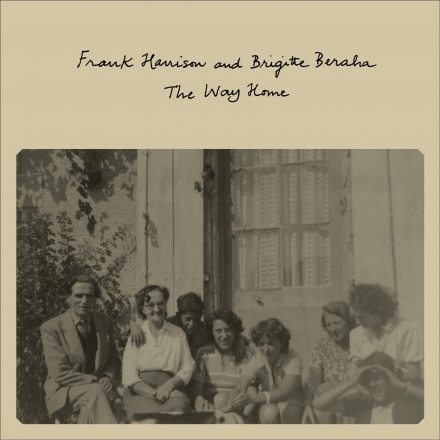 Notions of love and home are given shape in this recording by the lyrical piano of UK’s Frank Harrison, and the ethereal vocals of London-based Brigitte Beraha. Her words to the opening track The Man Who Cycled from India for Love tell the wonderfully romantic story of the Indian artist who cycled to Sweden in the '70s to create a new home with the woman he loved. On his journey he lived by drawing, but a painting of the woman was no substitute: "I couldn’t paint you at all/ You knew/ I’d find my way back/ Straight to you." The voice is dreamy with playful improvisation, a little like Norma Winstone, but also with a Scandinavian breathiness (Sidsel Endresen, Josefine Cronholm). Harrison’s subtly rubato, legato piano is surrounded by subliminal clouds of distant electronic sounds. The man who cycled from India and his wife liked the song so much, they travelled from Sweden to be at the album’s recent launch gig with their son. Beraha brings wordless vocals to the title track The Way Home, its arcing melody given a ghostly electronic echo. The chords are restless, hardly settling in a home key, then almost Schubertian. Harrison and Beraha respond sensitively to each other’s angular improvised phrases. You Can’t Go Home Again is Don Sebesky’s arrangement of the Adagio in Rachmaninov’s 2nd Symphony. It’s reprised from Harrison’s First Light album, but here on solo piano. It’s a ballad full of longing, driftingly Romantic with bitter-sweet cluster chords. In Maud Hart’s French poem De Retour, a man returns home to a quiet life; Beraha’s setting enlivens it with Latin rhythms and thoughtful improvisation. Harrison’s taut grooves show how rhythmically he can play, in contrast with the gorgeous rubato in some of the other pieces. There are memories of love – Beraha’s Joni-esque Day by Day has a touching vulnerability: "Love never lasts.../Outside my window/Someone’s footsteps echo another’s." The piano has hints of Bill Evans in its sweet triads and skipping three feel. Her Magica Nostra is sung in Italian (Beraha was born in Milan and raised in Monaco). The lilting Latin feel is joyful rather than regretful, remembering "our magic". The lyrics hint at feelings, as impressionistic as the John Taylor-like piano. Beraha’s lyrics to Harrison’s Falling have an oblique charm: 'Memories that I can’t recall…", as she improvises along with eerie percussive sounds from Enzo Zirilli. The piano recalls some of the ECM recordings of Giovanni Guido, with its flowing spaciousness. The piano is languid and limpid in the Satiesque The Broken Lantern ("…perfect light/Shining through the broken glass.") Harrison’s For Fred (and Robert) and Two Tone Tune, with their high, clear, wordless vocals, seem to be about abstract beauty for its own sake. They bring to mind the artistry of Winstone’s early work with John Taylor in Azimuth: the circling chords, counterpointed lines and huge vocal range. The scales of Two Tone Tune fall with somnambulant, playful quirkiness and unsettling harmonies. It’s a lovely album, stirring together jazz and classical influences – thought-provoking, imaginative and beautifully-played and sung. CD REVIEW: Skadedyr – Musikk! NEWS: Jon Hiseman (1944-2018) R.I.P.